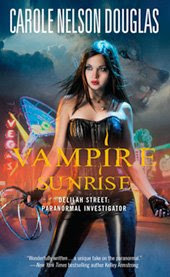 Saw this cover for Vampire Sunrise by Carole Nelson Douglas over at the Juno Books website, the third book in her Delilah Street: Paranormal Investigator series due Nov 24, 2009. I like. 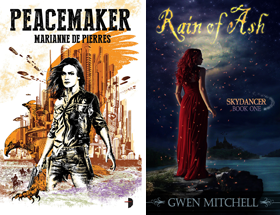 I saw you on Dottie's blog and came by for a visit..I'm into Sci-fi and paranormal...I write both. lush cover, i love that outfit. I see my good friend HAWK came by, Hi Hawk! Wow, Doug, you find the best covers, I think Vampire Sunrise looks so cool, I'll have to check this one out as well. Nice cover, but I've been disappointed by the first two books in the series (especially the second.) I keep going back and forth on whether or not I want to continue on with it. Thanks Hawk! Drop in any time. Michelle I like the silver mirror thing she has going on. Hey Chelle maybe third times the charm.